Back to reality on Monday. It has been a great spring break! I wanted a fun writing activity to start the week off. 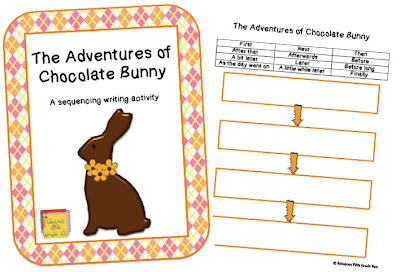 KB Konnected created these really cute chocolate bunnies that were begging for a writing activity. They are super cute!!! The writing activity includes a graphic organizer and a word bank for sequencing words. The Adventures of Chocolate Bunny!